Metin Kozak serves as an Associate Professor of Marketing in the School of Tourism and Hotel Management, Mugla University, Turkey. Also, he is a visiting fellow in the Department of Marketing, University of Namur, Belgium. Following a successful career within the last five years (since the approval of PhD degree in 2000), Metin has received two awards to mark his achievements. In 2001, his PhD dissertation on benchmarking was nominated, by the EFQM- EU, among the best three PhD studies on TQM. In 2004, by a committee of the Turkish Tourism Investors' Association, he was awarded the grand prize of the tourism researcher of the year 2003 in Turkey. He has published mainly in tourism journals and authored a book on Destination Benchmarking. His main research interests focus on consumer behavior, benchmarking, competitiveness, cross-cultural research, destination management and marketing, and European tourist markets. Luisa Andreu is Assistant Professor of Marketing in the Department of Marketing, University of Valencia, Spain. She obtained her Master's degree in Tourism from the International Centre for Tourism, Bournemouth University, UK, and a Ph.D. in Business Administration from the University of Valencia, Spain. She is a member of the Spanish Association of Scientifics in Tourism. She has published various articles in Annals of Tourism Research, Tourism Management, European Journal of Marketing, Journal of Travel and Tourism Marketing, among others. She has presented papers at several conferences organized by the European Marketing Academy, Academy of Marketing Science, CPTHL, and State of the Art: Tourism. She has also involved in numerous academic and industrial projects. Her research interests include consumer behavior and cross-cultural issues in service marketing. Preface. (M. Kozak and L. Andreu). Introduction. 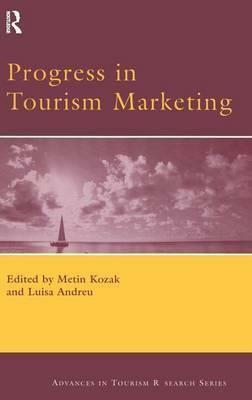 Tourism and Hospitality Marketing Research: Update and Suggestions. (Haemoon Oh, Byeong-Yong Kim and Jee Hye Shin). Part I: IT Marketing. (M. Kozak and Luisa Andreu). A Historical Development of "IT" in Tourism Marketing. (Y. Sari, M. Kozak and T. Duman). Use of Electronic Documents and Brochures for Sustainable Marketing. (Y. Sari, I. Cinar and D. Kutukiz). Online Travel Purchases from Third-Party Travel Web Sites. (C. Cobanoglu et al.) Part II: Destination Marketing and Competitiveness. (M. Kozak and L. Andreu). Destination Marketing: A Framework for Future Research. (A. Fyall, B. Garrod and C. Tosun). A Reclassification of Tourism Industries to Identify the Focal Actors. (D. Ermen and J. Gnoth). A Comparative Analysis of Competition Models for Tourism Destinations. (N. Vanhove). Media Strategies for Improving National Images during Tourism Crises. (E. Avraham and E. Ketter). Part III: Market Segmentation. (M. Kozak and L. Andreu). Using the Experientially-Based Approach to Segment Heritage Site Visitors. (A. Biran, Y. Poria and A. Reichel). Motivations and Lifestyle: Segmentation Using the Construct A.I.O. (A.M. Gonzalez Fernandez, M.C. Blanco and C.R. Santos). Correlates of Destination Risk Perception and Risk Reduction Strategies. (G. Fuchs and A. Reichel). Segmented (Differential or Discriminatory) Pricing and its Consequences. (A.D.A. Tasci, A.K. Gurbuz and W.C. Gartner). Part IV: Consumer Behaviour. (M. Kozak and L. Andreu). Seeking to Escape: Sights over Approach-avoidance Dialectics. (C.P. Marques). Cultural Approximation and Tourist Satisfaction. (M. Tuna). The Role of Non-Monetary Costs in a Model of Leisure Travel Value. (T. Duman, G.N. Kocak and O. Tutuncu). Studying Visitor Loyalty to Rural Tourist Destinations. (E. Kastenholz, M.J. Carneiro and C. Eusebio). Waiting Time Effects on the Leisure Experience and Visitor Emotions. (J. Gnoth, J.E. Bigne and L. Andreu). Effects of Price Promotions on Consumer Loyalty Towards Travel Agencies. (Sara Campo Martinez and Maria Jesus Yague Guillen).